Touted as an environmentally safe, biodegradable and nontoxic all-purpose cleaner, one of the many uses of Shaklee Basic H is as a pet shampoo. According to Petgroomer.com, not only have groomers used Basic H as an overall pet wash, but it works well at full strength to remove gum and other sticky substances from a dog’s fur. Regularly cleaning your dog with Basic H can help control fleas and ticks, and it doesn't leave behind a harmful chemical residue as most commercial flea treatments and medications do. Pour half an ounce of Basic H into a gallon of water. Mix well. Place the animal in a bathtub, washtub, plastic kiddie pool or a dishpan, depending upon the size of the dog. Put cotton balls into the dog’s ears to protect them from Basic H or water leaking inside. Wet the dog’s fur thoroughly with water from a kitchen sprayer, handheld shower or garden hose, depending upon where you decide to bathe your dog. Pour the diluted Basic H cleaning solution over the wet dog, starting at the head and working your way down the dog’s body to the tail. Use your fingers to work the solution into the dog’s fur, making sure to rub deeply enough to reach the pet’s skin. If your dog suffers from flea or tick infestation, pay particular attention to washing the dog’s neck and the area along the lower back, above the tail. These two areas are known hot spots for fleas. Apply a few drops of full-strength Basic H to stubbornly dirty areas, such as fur matted with gum, plant sap or tar. Wait a few moments for it to soften then rub the product through the mat until the fur feels clean. If the dog doesn’t seem clean enough, apply more full-strength Basic H directly to the animal’s fur and continue to shampoo until clean. Rinse the dog well with clean water, starting at the head and working toward the tail and working the water through the fur with your fingers until the animal is well-rinsed. Let the dog shake off excess water, then dry your pet well with a towel. Larger dogs will require a larger quantity of the diluted cleaning solution, so prepare several gallons of the Basic H mixture before starting to bathe a large dog. Note that Basic H is a low-sudsing cleanser, so you won't see the mounds of bubbles typical with other pet shampoos. Despite being a natural, nontoxic cleaner, even diluted Basic H can cause eye and ear irritation in pets. 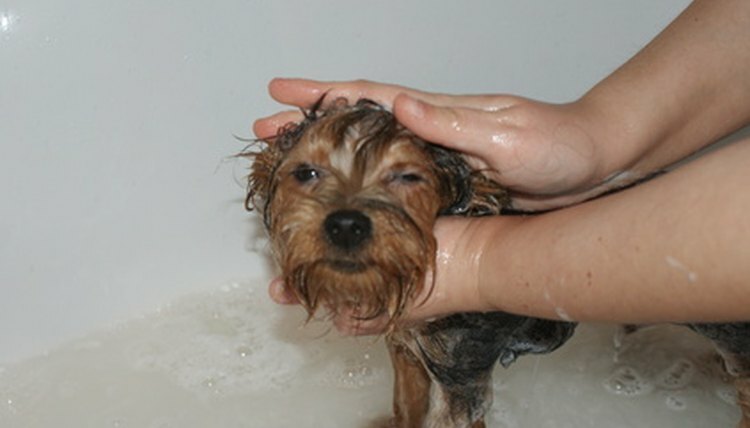 Use caution to avoid getting it into the dog’s eyes or ears during the bathing and rinsing processes. Based in Atlanta, Georgia, Angela Tedson has been writing slice-of-life articles since 2005. Her work has appeared in "Southern Family" magazine and "Angie's List" magazine. Tedson holds an Associate of Arts degree from the Art Institute of Atlanta. How do I Mix Fels Naptha Soap for Flea & Tick Control on Pets? What Do Groomers Put on Dogs to Make Them Smell Good?